Birthstones often have swashbuckling histories, but for me, emeralds have one of the swashbuckling-est of all. Above photo: Emerald crystals, Getty Images. I always think of Spanish conquistadors, those blood-thirsty gold-hungry invaders of South America, when I think of emeralds. They terrorized the native populations, tortured, enslaved, and slaughtered them. And once they had their booty on heavily loaded ships, they were hunted by pirates themselves. Often those overloaded ships went down in hurricanes in the Caribbean. Some truly amazing emeralds have come up with divers to those galleons. 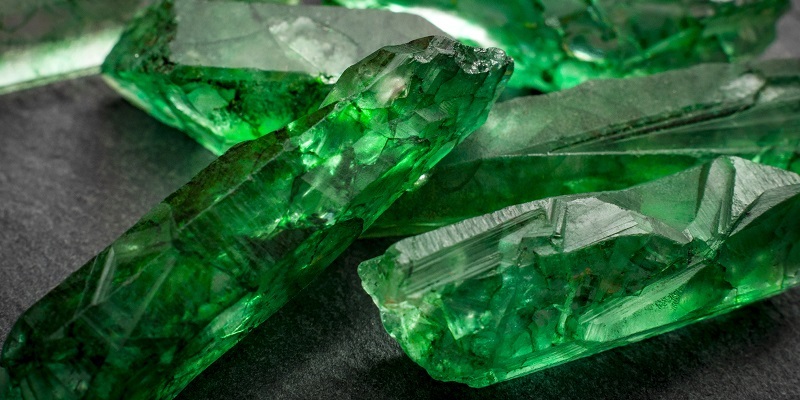 In 1558, the Spanish began drawing on the vast emerald mines at Muzo, Colombia, which produced high-quality emeralds. 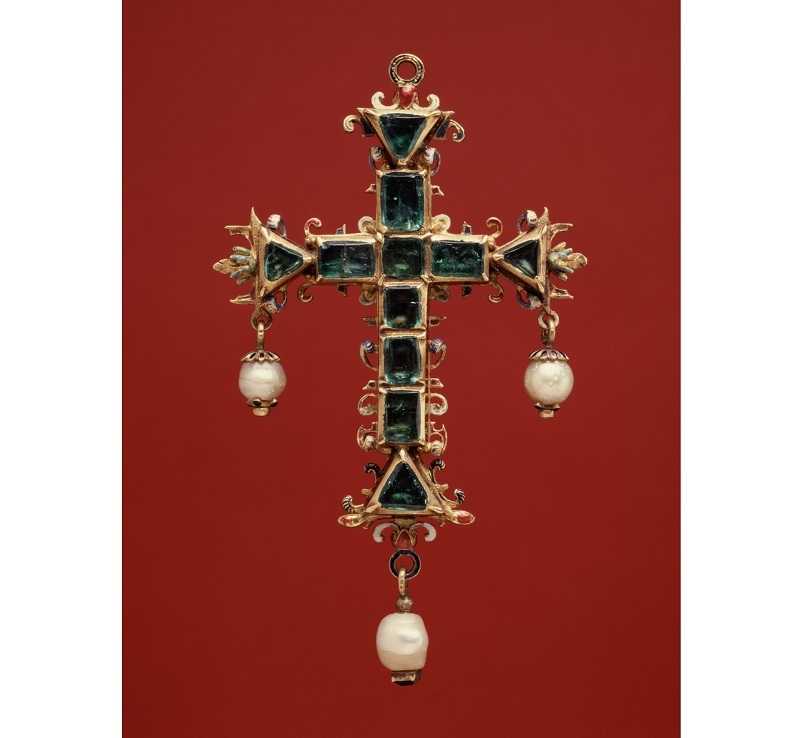 This style of cross, with large cut stones, was favored by wealthy aristocratic women of the Spanish court, including Archduchess Isabella. Photo: The Walters Art Gallery, Baltimore. When I worked for an appraiser, I was fortunate to see an emerald necklace hauled up by a group of divers. At some point, the emeralds had been cut (crudely by today’s standards) and set in 24 karat (pure) gold. Whether they were heading to Spain or returning to South America with some wealthy land-grantee’s wife, I don’t know. But oh, the color of those emeralds! They were magnificent huge stones probably from Colombia, which has produced some of the most breathtaking emeralds ever known. 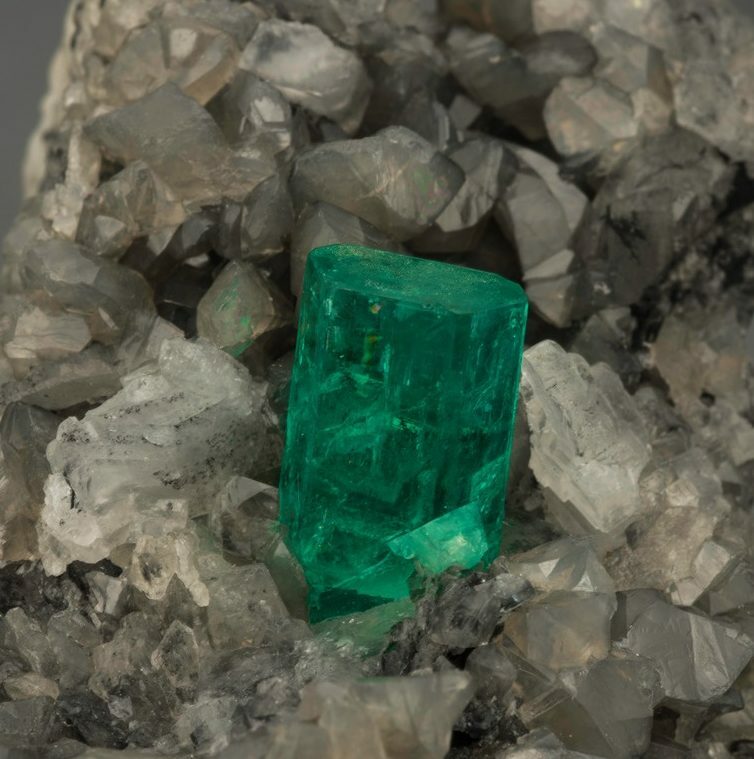 Imagine being the miner who came across this exquisite 7 cm (approximately 2.75 inches) long emerald crystal! Photo Mia Dixon, courtesy Pala International. I’ve never forgotten handling that necklace, once held by a woman of inestimable wealth, in a world I can hardly imagine. Her sense of entitlement would have made her oblivious to the appalling methods by which her gold and emeralds had been acquired. 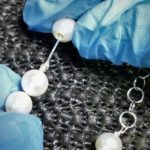 But assuming she was traveling with her jewelry, I can’t help but feel a bit sorry for the terror that must have been hers when that tiny ship was caught in the maelstrom of the hurricane that sucked it to the ocean floor where it, and she, lay forgotten for centuries.